The first recorded English name for the make-up we now call blusher was paint, in 1660. In the 1750s a new word, rouge, displaced paint, and remained in standard usage for around two centuries. Then, in 1965, an advertisement coined a new word for the product: blusher. Each generation speaks a little differently, and every language is constantly changing. It is not only words that change, every aspect of a language changes over time – pronunciation, word meanings and grammer. Packed with fascinating examples of changes in the English language over time, this entertaining book explores the origin of words and place names, the differences between British and American English, and the apparent eccentricities of the English spelling system. Amusingly written yet deeply instructive, it will be enjoyed by anyone involved in studying the English language and its history, as well as anyone interested in how and why languages change. R. L. Trask was a world authority on the Basque language and on historical linguistics. He wrote both academic and popular books, notably on grammar, punctuation, and English style and usage. His publications include Language: The Basics (1995) and Mind the Gaffe (2001). At the time of his death in 2004, he was Professor of Linguistics at the University of Sussex. The book has been revised by Robert McColl Millar, Senior Lecturer in Linguistics at the University of Aberdeen. 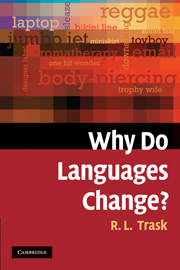 This book is intended to give a sense of language change to interested laypeople of any age; it is not a textbook. I do hope, however, that it will act as a door into historical linguistics for some readers. Because of its nature, I have made no assumptions about knowledge either of languages or, more importantly, of the techniques linguists use to describe language. If we are going to treat the subject in any depth or seriousness, however, I have found it necessary occasionally to use special terms and symbols in the text. I normally explain these, but I want to discuss some potential sticking points before we start. Readers may well find themselves coming back to this page occasionally. The Roman alphabet used for English is not terribly effective, as we will see, in representing the sounds of English, never mind the potential sounds found in all the world’s languages. Because of this, phoneticians and other linguists who work with sounds have spent a considerable amount of effort over the last hundred years and more developing an extended writing system, the International Phonetic Alphabet (IPA), which can describe all of these sounds. I will not use more than a handful of these symbols in this book, and only when necessary. Most of these symbols make sense to anyone used to the Roman alphabet: /p/ stands for <p>, for instance; /n/ for <n>. Sometimes, however, there is potential for confusion. IPA /j/ stands for the first sound in English yes; the <j> in judge is represented by /dʒ/ in IPA; IPA /y/ stands for the vowel in French tu. When potential headaches of this sort exist, I have highlighted them. It is worth noting that the vowel symbols in IPA stand for the ‘continental’ values associated with these letters. Thus /e/ stands for the vowel found in bay, if you are from Scotland and a few other places, not the vowel in bee. /a/ stands for the vowel in cat for most British people; while /ӕ/ is the vowel found in the same word in most North American accents (and some conservative upper-class varieties in southern England); /ɑ/ is the vowel found in words like bath in southeast England (other British varieties would have /a/). You may have noticed that I have used the convention / / to surround sounds in most of the book, but [ ] for a few. This represents a subtle but important distinction in sound perception. All speakers have the ability to produce all sounds which can be produced by humans. By the time they have reached school age, however, the number of separate sounds speakers perceive from this variety depends upon what language they speak. For instance, German speakers can, of course, make the sound [θ], as found at the start of English thing; unless they are trained, however, they hear it only as a variant of a larger unit, /s/. For most English speakers, however, the initial sounds in thing and sing are absolutely separate; to a German speaker, they are variants of the same essential sound. These essential sounds are called phonemes and are represented by / /; all variants of these phonemes are called allophones and are represented by [ ]. The important thing to remember is that how phonemes are laid out over the range of potential sounds differs from language to language. Spellings, when necessary, are shown using < >.